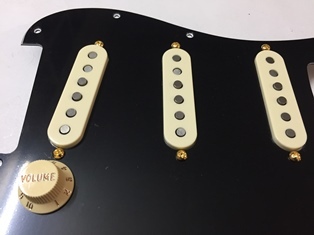 Black 3-ply loaded guards with aged white appointments and gold screws in SRV style. I build these loaded guards to order with a 3 week minimum build time. 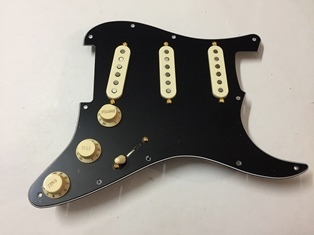 These are available in 11 hole USA spacing and USA ’62 style with no truss rod notch, please leave note at checkout for pickguard type. 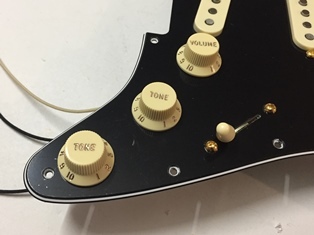 Leddin pickup models available for this pricing, please leave a note for required model at checkout. 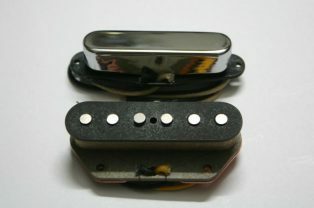 For more details on these pickup models please visit the handwound pickups page. 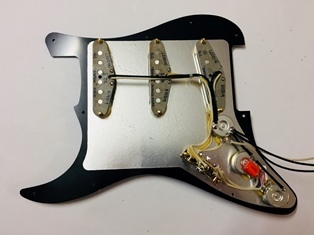 The picture is an example of an 11 hole USA spec guard loaded with my “Roodoo” Hendrix inspired pickups. 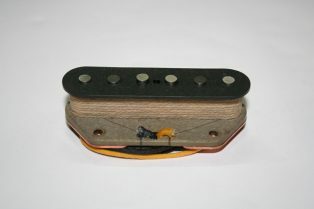 Leddin Handwound “Vintage 66” Telecaster bridge pickup 6.2k – Country Twang!